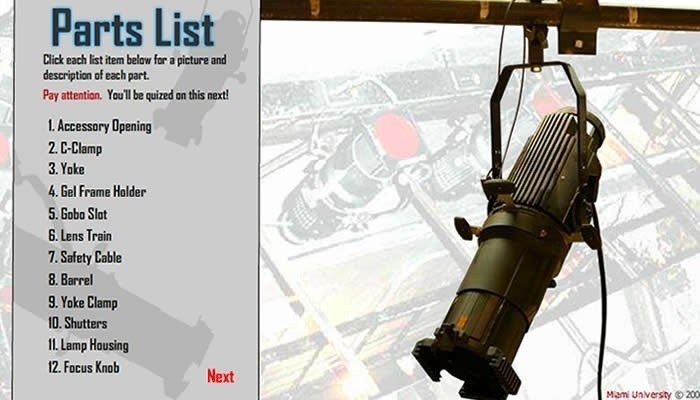 The light parts quiz is an interactive guide to the different components of a theater stage light. Students can explore the different parts by interacting with the light’s parts list. Once students are comfortable with the names and locations of the different components, they can quiz themselves with an interactive 3D version of the light. The architecture of this learning activity was recycled from the Sewing Tutorial learning object. See the Lighting Parts Quiz. This entry was posted in Interactive, learning activity, training and tagged electrical, fine arts, flash, lighting, theater by Britt Carr. Bookmark the permalink.